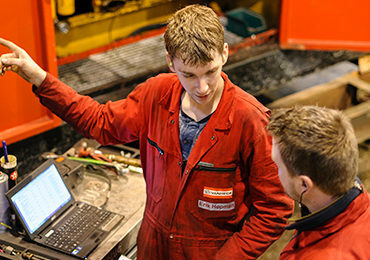 Van Heck Connect is the bespoke solution for the remote management and control of pumps. In consultation with you, we will set up this PLC to your exact requirements and specifications. In the event of technical faults or deviations, you will receive a notification on your mobile phone so you can take immediate action online. Van Heck Connect controls the pumps autonomously and van be managed via the Internet. The control system – including the security – can be programmed entirely to your requirements. Van Heck Connect continuously controls and monitors pressure and flow, levels, switch-on and switch-off levels, rpm, operating hours and water levels. System data is stored in the PLC’s memory. Van Heck Connect can control multiple pumps both simultaneously and independently. If required, you can easily switch to manual control. In the event of failure, Van Heck Connect immediately controls the spare pump. You will automatically receive error messages, including a clear description of the type of malfunction, by mobile phone or email. Van Heck Connect is extremely easy to implement for both electric and diesel powered pump units. Our frequency converter container has been specially designed to house the drive for the electrically powered pump units. In this soundproofed 10 ft container the frequency converters and control equipment enable you to control no less than five pump units. The Van Heck frequency converter container allows you to regulate the temperature and humidity inside the container and automatically start up any required generator.